It is that time once again, folks, to go out into the world and practice random acts of kindness. Time to bring smiles to strangers faces, and warm up yours in the process. 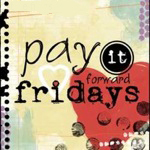 Have a great weekend everyone, and don't forget to stop by and let us know how YOU Paid it Forward!